Undoubtedly Salman Khan and Katrina Kaif look stunning together on celluloid and fans are eagerly waiting to catch their glimpse together. No worries there! Soon Salman and Katrina will be seen together in their upcoming film 'Tiger Zinda Hai'. 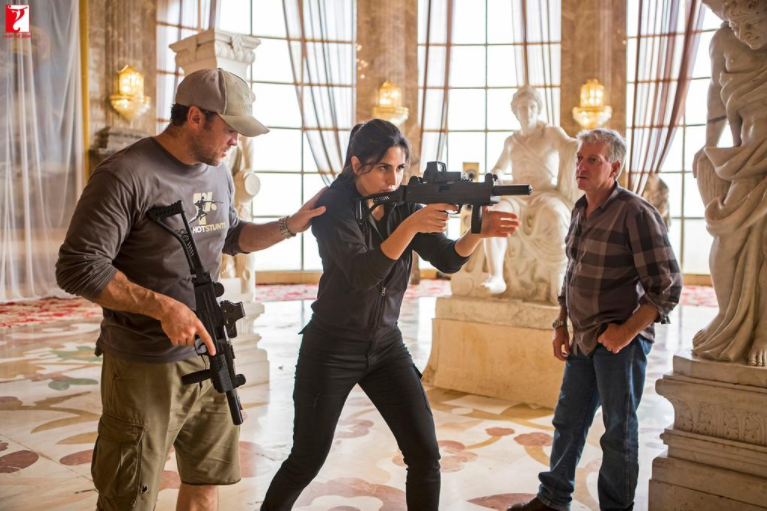 These rehearsal pictures show Katrina practicing gun shooting and sword fighting. A person from the film’s unit quoted to the Indian Express- "Director Ali Abbas Zafar has committed to deliver action, stunts and fight sequences that will compete with global standards with Tiger Zinda Hai. To shoot for Katrina’s action scenes, Tom Struthers, the action and stunts director of the film worked with her. Buster Reeves, the fight coordinator of many Hollywood films, also worked with Katrina on this portion. Given Struthers shot for certain action sequences for Christopher Nolan’s Batman films including the Dark Knight Rises, expect the absolute best from these scenes. There are also stuntmen from France, UK and Spain involved in this portion, which is quite elaborate." Directed by Ali Abbas Zafar and produced by Aditya Chopra, 'Tiger Zinda Hai' is one of the most awaited films of this year. It is scheduled to release on December 22, 2017. It is to be noted here that this film is a sequel to Salman Khan and Katrina Kaif starrer 2012 film 'Ek Tha Tiger'. The film will also star Girish Karnad, Paresh Rawal and Sudeep. 'Tiger Zinda Hai' will also mark Salman and Katrina’s on-screen reunion after five years, since the film’s prequel itself.